Last week’s economic news was a mixed bag with retail sales and housing starts coming in lower than expected, but home builder confidence in housing markets increased. Weekly jobless claims fell, and Fed Chair Ben Bernanke testified before the Senate, saying that falling gold prices were an indication of increasing confidence in the economy, but that it was “way too soon” to say when the Fed’s quantitative easing program would be reduced. Monday: Retail sales for June came in lower than expected at 0.4 percent. Economists estimated a reading of 0.9 percent based on May’s reading of 0.5 percent. Tuesday: June’s Consumer Price Index (CPI) came in as expected at 0.5 percent against May’s reading of 0.1 percent. The NAHB/Wells Fargo Housing Market Index (HMI) for July gained five points for a reading of 57, which exceeded expectations of a reading of 52. Builders cited a short supply of existing homes and falling materials prices as factors contributing to June’s stronger reading. Wednesday: Housing starts in June fell to a seasonally-adjusted annual rate of 836,000 against expectations of 950,000 and May’s revised reading of 928,000. Regional weather and a surplus of unused building permits were seen as contributing to fewer housing starts in June; analysts did not see the dip in housing starts as a sign of softening housing markets. Thursday: Fed Chair Ben Bernanke testified before the Senate as noted above and was careful to emphasize that economic data received after the last FOMC meeting indicated that it is “way too soon” for the Fed to change its monthly volume of Treasury bonds and MBS purchases. This is good news for mortgage markets, and possibly for mortgage rates, which fell this week. Freddie Mac reported that average rates for a 30-year fixed rate mortgage fell by 14 basis points to 4.37 percent; average rates for a 15-year fixed rate mortgage fell by 12 basis points to 3.41 percent; these rates include average discount points of 0.7 percent. The average rate for a 5/1 ARM was 3.17 percent with discount points of 0.6 percent. The 5/1 ARM provides an affordable alternative to rising fixed mortgage rates. Friday: No significant economic news noted. 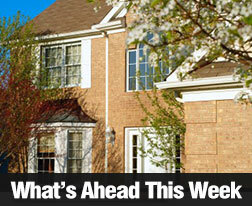 This week’s schedule includes Existing Home Sales on Monday; on Tuesday, the FHFA releases its Home Prices report. New Home Sales will be released on Wednesday; Thursday brings weekly jobless claims and the Durable Goods report. The week will finish with the Consumer Sentiment report on Friday.